Maryland Sea Grant, part of the University System of Maryland, plays an important role in the network of organizations working to preserve and restore the Chesapeake Bay and Maryland’s coastal waters. We serve as a bridge between scientific expertise and the needs of people who manage, conserve, enjoy, and make their living from the Chesapeake Bay, America’s largest and most productive estuary. Our mission combines scientific research, education, and public outreach. Guided by our strategic plan, we work to develop sound ideas and practices that can enhance the Bay’s ecology as well as the businesses and jobs that depend on it. Working with a variety of partners, we act as an “honest broker” to spread science-based, useful, unbiased solutions to a wide audience. We are pursuing these efforts at an important time in the Bay’s history. An unprecedented array of activities is underway to reverse decades of damage to the Chesapeake and coastal bays’ environments. Research: A cornerstone of our program is the funding of scholarly research at the region’s universities and labs that is relevant to the Bay’s restoration. These research projects improve understanding of Bay ecosystem dynamics, water quality, commercial fisheries species, and more. Many of these studies’ findings offer direct applications to public policy and management of natural resources. Education: We work to improve and spread environmental-science education at all educational levels. We help school teachers obtain professional development training and create new marine-science based lesson plans they can use in the classroom. We support graduate fellows who work directly with funded researchers and sponsor undergraduate students through a summer research program. Extension: Our specialists across Maryland share sound conservation and business practices with diverse audiences. 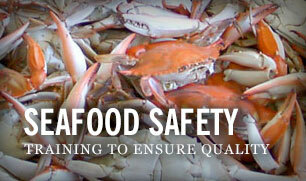 We advise community groups, teachers, government officials, aquaculture businesses, seafood processors, and others. We offer expertise in aquaculture, education, seafood technology, marine economics, land-use planning, and water quality. Communications: Our communications staff plays a key role in informing the public about how scientists are helping to understand and preserve the Bay. We produce a quarterly magazine, documentary films and short videos, and news articles that provide context, depth, and narrative that nonscientists can understand and enjoy. Read our free award-winning magazine, Chesapeake Quarterly. Strengths in scientific synthesis: Issues surrounding the marine and coastal environment are inherently interdisciplinary -- they are as much about social science and economics as marine science. We fill the challenging role of bringing together diverse information from multiple sources and crafting a big-picture understanding of issues through reports and workshops. For example, we convened a scientific review of the long-running efforts to replenish the Chesapeake’s native oyster population. The review’s conclusions led to new insights and public discussions about the importance of monitoring and evaluating restoration efforts to assure their effectiveness. Strengths in facilitation: We build bridges among researchers and other groups who care about Maryland’s natural resources. We are called upon to guide discussions and decision-making processes among multiple stakeholders about environmental issues that can be contentious and complex -- for example, a five-year project we facilitated on Ecosystem-Based Fisheries Management. We strive to provide a neutral platform where fair and informed solutions to complicated and sensitive issues can be developed. Maryland Sea Grant, founded in 1977, is administered by the University of Maryland Center for Environmental Science. Funded by the National Oceanic and Atmospheric Administration and the State of Maryland, Maryland Sea Grant forms part of a network of 33 university-based Sea Grant programs around the country. Our program’s management approach includes a strategic plan developed through dialogue with representatives of the wide range of audiences invested in the issues we study. Learn more about Maryland Sea Grant’s achievements. Read a message from our director, Fredrika C. Moser, Ph.D.